TVB veteran actress Angelina Lo (盧宛茵) received a standing ovation after her guest appearance in a special Lunar New Year episode for the sitcom Come Home Love: Lo and Behold <愛‧回家之開心速遞>, with netizens urging TVB to consider bringing back Angelina as a regular cast member. 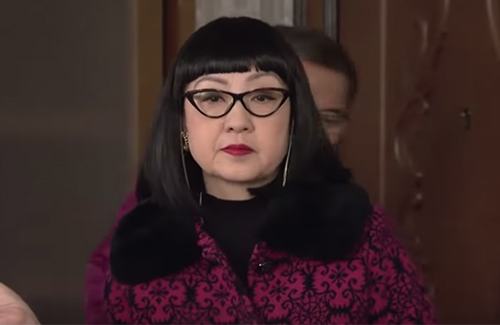 Lo and Behold’s hilarious February 7th episode featured Angelina as the Hung family’s harsh and sharp-tongued relative Auntie Chui, who became the bane of everyone’s existence whenever she visits the Hung family for Lunar New Year. Every single year, Auntie Chui would make unkind remarks about how the three Hung sisters Sin (portrayed by Joyce Tang 滕麗名), Mary (portrayed by Koni Lui 呂慧儀), and Sam-yu (portrayed by Andrea So 蘇韻姿) were still single. This year, their father Kan (portrayed by Lau Dan 劉丹) decided to find fake partners for his daughters so they wouldn’t have to listen to their aunt’s rants again. Unfortunately Auntie Chui came earlier than expected, and Kan had to quickly come up with a plan B. To stay on script, Kan randomly selected people to be their daughter’s partners. Kan first got Chiu Wai (portrayed by Andrew Yuen 袁文傑), Sin’s boss, to play as Mary’s boyfriend. After Mei-lai (portrayed by Yukimi Chung 鍾凱琪) was praised by Auntie Chui for being “fertile,” she suddenly became On Zai’s (portrayed by Kalok Chow 周嘉洛) girlfriend. On Zai’s real girlfriend Bonnie (portrayed by Iris Lam 林凱恩) then became Yan’s (portrayed by Pal Sinn 單立文) girlfriend, while Yan’s wife Ko Pak-fei (portrayed by Angela Tong 湯盈盈), who came late, was now suddenly Kan’s wife. It was nothing but confusion. Auntie Chui then came to the “disturbing” conclusion that the Hung family had issues, after mistakenly thinking that Ko Pak-fei was cheating on Kan with Yan, and catching an intimate moment shared between On Kai and Bonnie. Auntie Chui also overheard Sin telling Chiu Wai, “I’m pregnant, and the father isn’t you.” She then spotted Kan acting close with another married woman. Angelina Lo’s impression is accurate. Tons of relatives that act exactly like this. Potty mouths. one of the best episode, I sure hope TVB consider bringing back Auntie Chui more often in the storyline or have a spin-off about her and the family, they did mention she had a son.